Sonic the Comic 13 is the thirteenth issue of the Sonic the Comic series by Fleetway Editions Ltd. 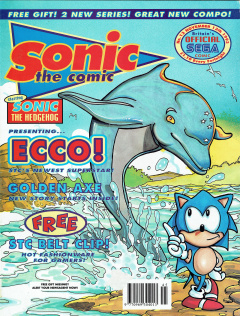 The comic contained four strips; a main Sonic story followed by three shorter strips based on other SEGA franchises: Ecco the Dolphin, Golden Axe, and Decap Attack. Control Zone: Introductions and Staff Details. News Zone: Information on upcoming SEGA events and products. Speedlines: Reader letters and artwork, with replies from Megadroid, the comic's mascot character. 1 Sonic the Hedgehog - "Double Trouble"
2 Ecco the Dolphin - "Ecco the Dolphin, Part 1"
3 Golden Axe - "Plague of Serpents, Part 1"
4 Decap Attack - "Starring Chuck D. Head! Part 4"
Sonic the Hedgehog - "Double Trouble"
Tails is kicking a football around in Emerald Hill Zone when he finds a Monitor with Sonic's face on the screen. Sonic tells Tails that Doctor Robotnik trapped him inside and that he needs to press a button on the monitor to free him (better than jumping on it I guess). Tails does so and an evil-looking version of Sonic (complete with jagged-looking ears, sharper pupils and fangs) erupts in a explosion of flame, calling Tails a 'little snot' in the process. Nearby a group of animals (including Porker Lewis and Johnny Lightfoot, though they aren't mentioned by name) are constructing a "new hideout that Robotnik knows nothing about". They see Evil-Sonic approaching and naturally assume it's the real Sonic... that is until he blasts past them; destroying the scenery and referring to the animals as 'scuzz-balls' (quite the potty-mouth on Evil-Sonic). He then speeds off toward a nearby forest; setting it ablaze with his super speed. While Evil-Sonic splashes the local animals by dashing through a river and circling back to the new hideout, a squirrel named Sally wonders what's gotten into Sonic. After destroying a power-plant, Evil-Sonic is tripped up by the real Sonic who has heard that someone has been giving him a bad rep in the Zone. Sonic kicks Evil-Sonic to curb; punting him into the distance. At this point the animals arrive and mistakenly assume that the real Sonic is the one who has caused all the damage to their hideout. Sonic pleads innocence, trying to explain that he has a totally weird, evil double. Sally speaks for all of the Zone's inhabitants and informs Sonic that they can't take any risks and that he might betray them to Robotnik, adding that they want him banished. Evil-Sonic then re-appears and attacks Sonic; Sonic delivering a well-deserved "I told you so!" to Sally. Sally replies that the apology is in the post. Gee, thanks. Nearby, Tails has regained consciousness and notices the on-going battle between the Sonic's at the hideout. He picks up the now-empty monitor and heads towards the action. Evil-Sonic exposits that he was created by Doctor Ovi Kintobor before he turned evil to be an 'Extra Life' for Sonic to "lend a hand to the worlds most important hedgehog" and that he's been trapped in the box for years. Tails then arrives with the empty Monitor, stating that there's only one true Sonic the Hedgehog. Evil-Sonic then gets sucked into the box and Sonic super-kicks it into space. Sally apologizes and says that she should have known that ugly wasn't the real Sonic all along. Sonic states that he thought he was kinda handsome. Ecco the Dolphin - "Ecco the Dolphin, Part 1"
Suddenly a Killer Whale smashes into the sharks, scattering them in all directions. Ecco thanks the whale for his timely assistance, to which the orca replies that he put up a brave struggle, though now the Little Fin must provide him with some help. He goes on to explain that he found a large jewel in his part of the sea and that when he touched it Ecco's face appeared! As they swim, Ecco explains that the jewel is a Glyph, or a Jewel of Knowing. He has been using them to search for his missing kin and knows that in some part of the sea there will be a Glyph that will lead him to them. They arrive at the Glyph, a large pink jewel, and Ecco sends a sonar wave towards it. The Glyph speaks, explaining that Ecco will need to travel to the past to find the beginning of the answers he seeks. Ecco touches his nose to the jewel and it immediately sucked into a whirlpool. Next issue: Jurassic Beach! Golden Axe - "Plague of Serpents, Part 1"
On their way to return The Golden Axe to the King of Yuria; Ax-Battler the Barbarian, Gilius-Thunderhead the Dwarf and Tyris-Flare the Amazon decide to stop by Gilius' home; the stronghold of Rockguard. As they approach they are attacked by an enormous snake, which is quickly dispatched by Tyris using The Golden Axe. Gilius wonders what a snake that size is doing so near to Rockguard. They make their way to the stronghold's entrance, finding the area littered with unconscious dwarves with snakes wrapped around them. Inside is a scene of chaos, with bald cultists wielding snake staffs attacking Gilius' people. Ax notices a slightly more important looking cultist with three snakes around his neck standing nearby. The cultist refers to himself as The High Priest Cobraxis and leaves the battle to find the Dwarf Queen. Ax and Tyris join the battle, Tyris immediately being stopped by a cultist wielding a snake that begins to hypnotize her. She averts her gaze and slices the snake in two. Ax is having a similar problem nearby, however he cuts down the cultist instead of the snake, which wraps itself around him as the hypnosis takes effect. Unfortunately for the snake, Ax's sword falls from his grasp and cuts it's head off. With no-one to provide orders, Ax wanders off, muttering that he must obey. Nearby an old Dwarf squares off against a staff-wielding cultist, who darts forward and strikes him with the staff's 'fangs'. As the cultist prepares for the killing blow, Gilius attacks from behind, yelling "Father!" in the process. Gilius' father complains that this dying lark is giving him an appetite. Gilius declares that it's time for some Thunder Magic. Decap Attack - "Starring Chuck D. Head! Part 4"
Max D. Cap is demanding to know why Prof Frank N. Stein hasn't created his undead army as promised. He is fully aware that Chuck D. Head was created using the same methods and wants to know what the delay is. Rupert complains that they are already running way over budget. The Professor explains that the conditions for creating Chuck were exactly right and that it would be hard to re-create the same state. Igor states that in other words the whole thing was a complete fluke. The Professor explains that if he had Chuck on-hand he would be able to clone him, which is met with more detriment from Igor. Max warns that he had better be right, as he has just dispatched his minions Bullhead and Croc to find Chuck and bring him back to the castle. Chuck and Head have apparently been wandering around the castle for the past five days, completely lost. Above Chuck's head is a box showing how many lives he has remaining, of which there are currently two. As the duo walk straight past a sign pointing to the laboratory they blunder straight into Bullhead and Croc. Head tells Chuck to use the bomb they found in the armory, a footnote explaining that they found the bomb between issues and 'how sneaky the writer is'. Chuck lights the bomb using matches he also found in the armory (the writer is apparently very sneaky, advises another footnote), however the minions attack; causing Chuck to drop both Head and the bomb down the stairs. He grabs both at the same time and lobs one at his foes while placing the other on his shoulders. Head keeps shouting to chuck the bomb, at which point Chuck realizes that he may have gotten the two items mixed up. The bomb explodes, knocking another life off of the indicator above Chuck's head. The issue end with the minions discussing whether Chuck is too badly hurt or not. This page was last edited on 19 March 2019, at 17:56.